I am having a little bit of birthday cake drama at the moment. I am in love with this rainbow sprinkle cake from The Great Cake Company. I wasn't really planning on doing a cake for Livi because she wanted to go out to eat at The Cheesecake Factory. I figured we would be having cheesecake. But now I am in love with this cake. And if the outside wasn't cute enough, check out the inside. I think I might have to recreate it in Halloween colors for Ruby instead. But as cute as that would be, nothing is as fun as a rainbow! 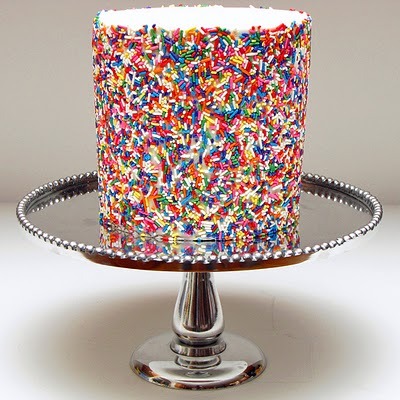 You can check out the rainbow sprinkle cake HERE and more fun rainbow party ideas HERE. 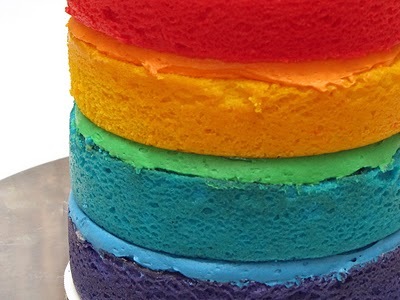 This is such a fun and easy cake, love the colors.